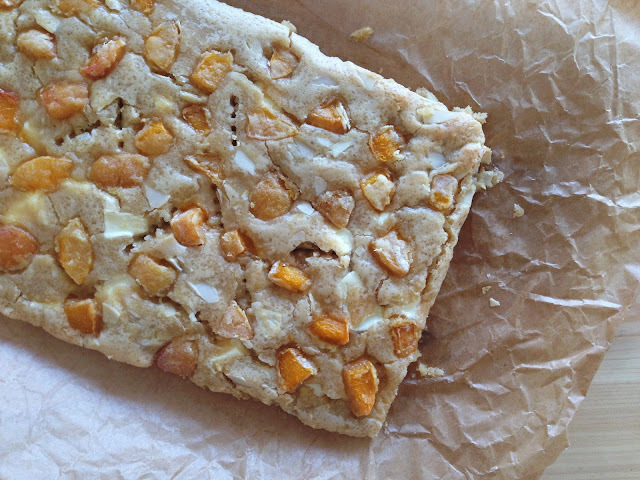 Melt-in-your-mouth summer blondies, with the irresistible taste of brown butter, packed with gooey white chocolate chunks, thinly sliced almond and fruity fresh apricot pieces. They are so wasy and quick to make, plus they take little time in the oven, which makes them the perfect comfort treat for when it is hot outside, yet the heart still asks for some warm pick-me-up. One warning though: they are extremely addictive! Munich is a terribly moody city when it comes to the weather. Maybe someone has forgotten to explain this city how seasons should work, or maybe it's them who have forgotten the city at some point over the ages. Fact is: once more, spring has come and gone, summer is supposed to be back, yet, looking outside, nothing quite seem to prove it. That's fine for me now, I've grown fonder of this crazy weather, even if I miss our west coast summer and sea a little bit too much. Nonetheless, sunny days and good weather usually mean more smiles, more energy, and an overall better mood. If the weather and emotions are connected, one can definitely acknowledge Munich as a bipolar city. This time of the year always brings out the fruitaholic in me. If it weren't for the lack of plenty important nutrients, I could possibly live on nothing but fresh summer fruit. Browsing the fresh food aisle at the supermarket takes two to three times longer than usual and when I finish - and picture this, where I do my grocery shopping, that is the first section one goes through - I usually have to pick up a second shopping basket. There's nectarines - my ultimate summer staple, - peaches, apricots, strawberries, cherries, all sorts of other delicious fresh berries, pineapples, all sorts of melons and, oh my dear, so many different colours, textures, flavours and shapes! It doesn't take me too long to sort out what I want to take home - everything! How could it not be? There is also no problem when it comes to making it all disapear from the fridge... it's actually crazy how fast it does! These apricots, though, were left quite forgotten, a bit like Munich and the weather, and I had to use them up before leaving for the US two weeks ago. I've decided to do what I'ld normally do: I baked them, and I've baked them with style. 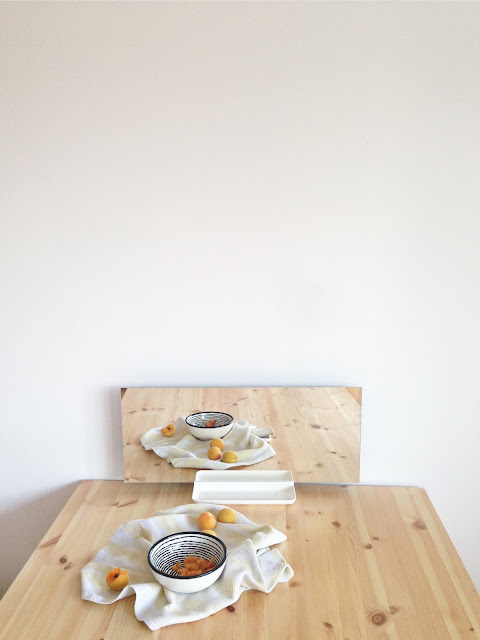 A few recipes around the web were inspiration to create my own apricot-based recipe from scratch. I think I was divided between a galette and some sort of apricot squares, but blondies won me over in the end, because I wanted to make something with white chocolate. The almonds came by instinct right after. I had to make them twice, because I didn't get the quantities right the first time, and I am glad I did, because after the first time failure, they turned out just perfect the second time. 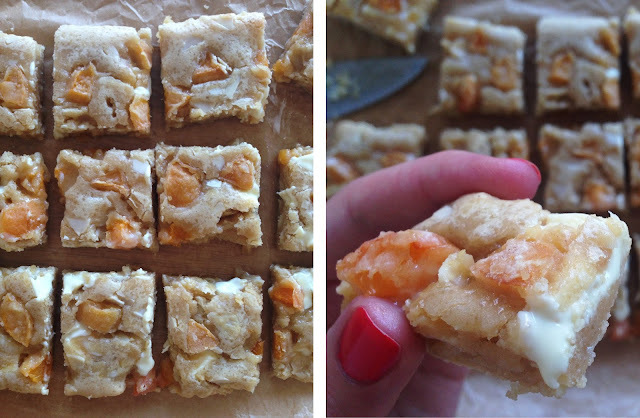 If cookie dough, apricots and/or gooey white chocolate are your thing, this is something you must try! Be warned, though, that you may need to dispatch some of them someone else's way as to not see the numbers go up on the scale - I would never guess how addictive they are! They are the perfect sweet and buttery comfort pick-me-up for your summer you never knew you needed, and you know you bake to make them right about... now! blondies de manteiga noisette com alperce, amêndoa e chocolate branco. que se derretem na boca e desaparecem num instante. Derreter a manteiga até obter manteiga noisette (ver este post), mexendo sempre. Verter para uma taça e deixar arrefecer. Pré-aquecer o forno a 180ºC. Forrar um tabuleiro de forno fundo rectangular com cerca de 25x20cm com papel vegetal. Cortar o alperce em pedaços pequenos e passar bem pelas 2 colheres de sopa de farinha. Remover a farinha em excesso e reservar. Numa taça grande, juntar os açúcares. Adicionar a manteiga noisette e bater com a batedeira por um par de minutos. Juntar o ovo e a baunilha e bater novamente durante cerca de 5 minutos na velocidade máxima. Incorporar a farinha e o sal com a ajuda de uma espátula, até obter uma massa bem espessa e macia. Por fim, incorporar o chocolate e a amêndoa. Espalhar a massa dentro da forma preparada e pontuar com o alperce preparado, pressionando-o para que se afunde nesta. Levar ao forno cerca de 15 minutos ou até um palito espetado no centro sair limpo. Deixar arrefecer antes de desenformar e cortar. 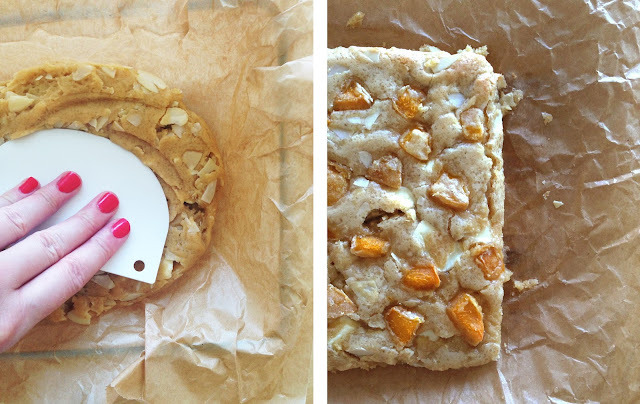 apricot, almond and white chocolate chunk brown butter blondies. they melt in your mouth and may very well disappear in a blink of an eye. 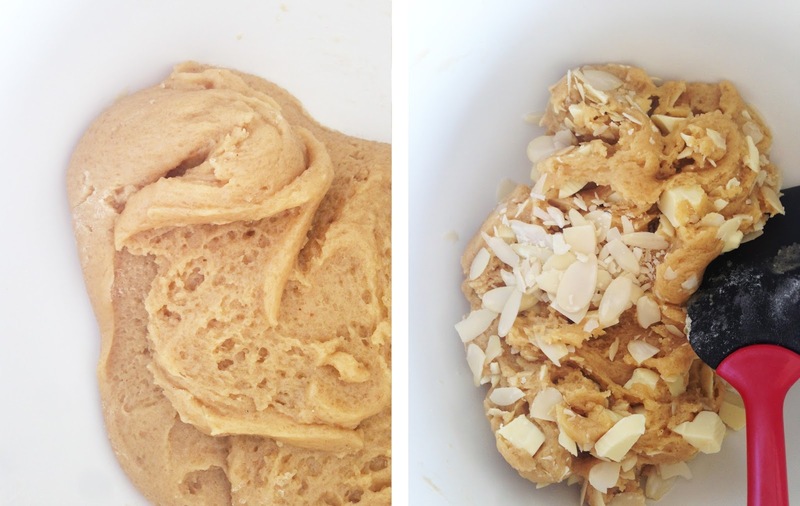 Melt the butter until turns into brown butter (see this post), always stirring. Pour into a clean bowl and let cool. Pre-heat oven at 180ºC. Line a rectangular baking tray, about 25x20cm large, with parchment paper. Chop the apricot in small chunks and roll them in the 2 spoonfuls of flour. Discard excess flour and set them aside. In a big bowl, mix both sugars. Pour over the butter and beat with a hand-mixer for some minutes until smooth. Mix in the egg and vanilla and beat for some more 5 minutes, maximum speed. Fold in the flour and salt and knead until reaching a thick and smooth dough. Fold in the chocolate chunks and laminated almond. Spread the dough on the bottom of the prepared pan and spread the chopped and dusted apricot over, punching it down as to stick it into the dough. Bake for about 15 minutes or until a toothpick inserted in the middle comes out clean. Let cool before removing from the pan and slicing. Têm um aspeto maravilhoso!! Não tenho dúvidas de que serão uma delícia! !